If you are doing any kind of serious project, you sure want to use some sort of dependency injection. Promotes loose coupling between classes and subsystems - Since classes are not dependent on a specific implementation, they are dependent on the contract that the other classes expose. Alright, so we need dependency injection, what next? How do we implement dependency injection? Should we hand code the logic and create our own way of doing dependency injection? Well, take my advice, never ever, never every do that! Always look for options, you will surely find one depdendency injection framework/container that suites your requirements. Even if it does not fit your requirement completely, I am sure the framework/container provides enough hooks, based on which you can customize it to you taste! Spring.NET is an awesome dependency injection framework (actually its lot more than that). Its open-source and its design is based on the proven Java based Spring Framework. The breath of functionality in Spring .NET spans application tiers which allows you to treat it as a "one stop shop" but that is not required. The best thing about Spring .NET is, its not an all-or-nothing solution. You can use the functionality in its modules independently. Spring.NET integrates with a lot of other projects like NHibernate, NUnit, Active MQ, Quartz .NET, Velocity etc. Enough about Spring.NET, if you want to know more details about Spring.NET, I strongly recommend visiting this site, it has all the info you need. It has links to the latest documentation, blogs, articles, faq's etc. By this time we agree that, we should use a dependency injection framework and for the sake of this post, I am going to show how easily we can integrate the Spring.NET dependency injection framework in our MVC3 application. Lets not waste any more time and jump into the code straightaway to get this part started, shall we! Add the Spring.NET dependencies to the project. Lets have a look at each step one after the other. 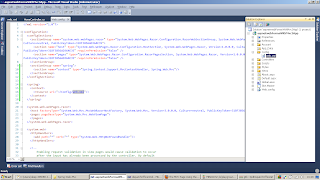 For integrating Spring.NET in your MVC3 application you will need to add references of following Spring.NET assemblies. These dll's can be found in the downloaded Spring.NET zip package from this link. 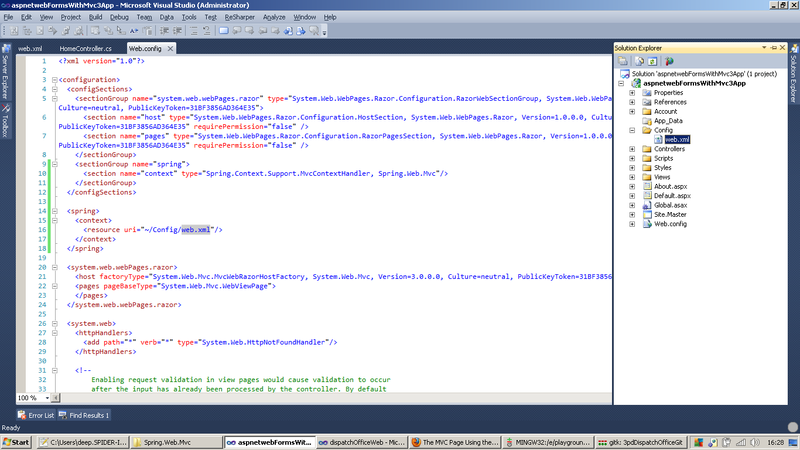 What we are doing here is, telling Spring.NET to look for a file called web.xml inside the Config directory. What will the web.xml file contain? It will contain the dependency injection configurations for the classes in our application. The web.xml is just a plain XML file that uses Spring.NET xml schema to inject the AccountService into the HomeController. We have given an id to the HomeController its Home in our case. We are also declaring that HomeController has a property Called AccountService. This property will be auto injected by the Spring.NET container with the reference of type AccountService. Notice that the HomeController is not a singleton class. MVC3 framework creates a new instance of the Controller every time a request comes for that controller. Hence, Spring needs to know that, the HomeController is not supposed to be a singleton class. This is done by adding the attribute singleton="false" in the declaration of the HomeController. The next declaration in the web.xml is that of AccountService. For the sake of this example this class has no dependencies. For our example this class is going to be very simple it will return some hard coded values. Notice that the singleton attribute has not be specified for the declaration of AccountService. By default the singleton value is true, this means that the AccountService is a singleton class. Spring.NET will instantiate only one instance of the AccountService for the entire application! As seen in Step - 2, HomeController is going to have a property of type AccountService. We are going to query the AccountService to get the user count which will be eventually be shown on the UI. As you can see there is no magic in our classs. HomeController simply calls the AccountService to get the UserCount and sets the value in the ViewBag. The AccountService implementation is extremely simple, it returns a hardcoded value of 5454. Lets look at the view SpringIndex.cshtml that will show the UserCount from the ViewBag. As you must have guessed, the view could not have been any simpler. It simply shows the message with the UserCount in it. We are almost done with all the plumbing required to integrate Spring.NET with MVC3 but, one last thing is left. We need to inherit our Global class in the Global.asax.cs file from Spring.Web.Mvc.SpringMvcApplication instead of System.Web.HttpApplication. This is required so that Spring registers the controller factory to instantiate the Controllers when the request comes. This is done so that Spring gets an opportunity to dependency inject the controllers. The User count 5454 is coming from the AccountService which we successfully injected into the HomeController. SpringIndex.cshtml is rendered which shows UserCout! 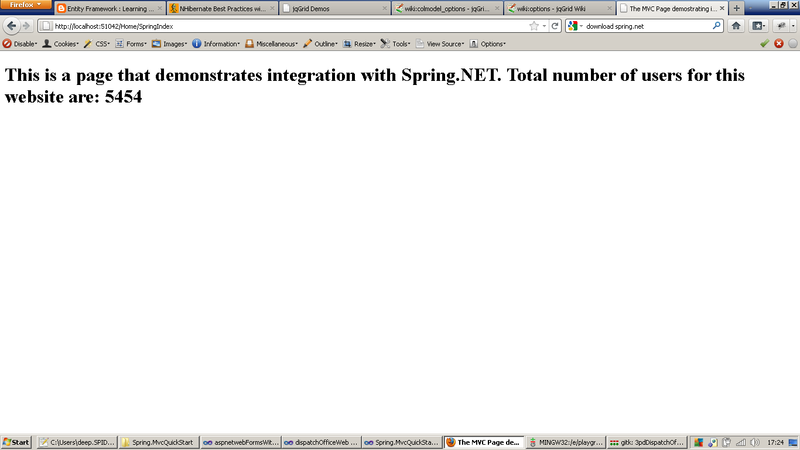 We have successfully integrated Spring.NET with a MVC3 application! That's all folks! how to download your demo project? Article is very good, I like it. I am unable to download the code from above link and I can only see file names and changes. How do I download.Please explain.